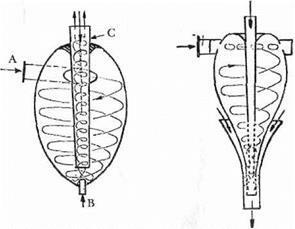 The concept of the vortex was central to Schauberger’s work. It is also emerging to have application to fundamental physics. The vortex is a key principle which casts new light on the findings of physics. The vortex points to a completely new understanding of the physical world. At the same time, it opens the door to the super-physical. To most of us, the physical world seems solid and substantial. Yet modern physics has shown quite clearly that this solidity is an illusion. Matter is made up of atoms and these atoms themselves are mainly empty space, containing sub-atomic particles such as protons and electrons in constant movement. When, as children, we see the water spiralling down the bathtub drain, we can become aware that Nature works in a spiral. We later discover other phenomena in which this spin occurs, such as DNA, cyclones, beanstalks, magnets, galaxies and other forms of Nature, but few have considered that the spiral is the force behind all of Nature as have scientists like Schauberger, Pythagoras, John Ernst Worrell Keely (1837­1898) and Nichola Tesla (1856-1943). It is likely that Viktor Schauberger’s ideas, and the research he has inspired, will stimulate radical new thinking about environ­mental care on several different fronts. He criticized prevailing science’s understanding of Nature for ‘thinking one octave too low’. He meant that the mechanical materialistic approach dominated at the expense of a qualitative view of Nature. Two variations of an accelerator for nuclear fusion. Schauberger worked on these prototypes as safer alternatives to the reactors currently used in nuclear power stations. After Viktor Schauberger’s death, biotechnical research has, in a practical way, concentrated on developing new methods and apparatus for the caring of the environment and for bio­synthesis. In Sweden there has also been background research into the physics of water and forests, from the direction pointed to by Schauberger’s work. Viktor Schauberger’s life’s work was not buried with him. The thoughts he threw out to the world continue after his death, and inspire other scientists to condnue his works. Soon after Viktor Schauberger’s death a working co­operation was established between those who were closest to him. The Biotechnical Academy was formed in Austria under the leadership of Walter Schauberger. In West Germany an association for the advancement of biotechnology (Verein Zur Forderung Der Biotechnik) was started, to be followed by similar associations in Austria, Switzerland and Sweden. Since the beginning of the 1960s many academic courses have been running with a bias towards biotechnological studies. The periodical, Implosion, started by Kokaly in 1961, has published four issues a year since then. The people I have personally met who knew Viktor Schauberger are unanimous in agreeing he was an honest and decent man – natural and hearty, and with a fine sense of humour. If, however, he met with dishonesty or pretence, he became intolerant at once, without regard for the social background of the guilty party. He thrived in the company of farmers, foresters, and hunters, and the simple life of the forest and country. He did not shy away from social gatherings and always impressed people with his strong personality and dignity. When Viktor Schauberger died, an extraordinary and moving personal crusade ended. All his life he had fought for water, forest and soil, for Nature’s wholeness and order, but he had seldom received any acclaim. Attacked, pursued, persecuted, interned, and finally sick and impoverished, he continued to search for a last chance of realizing his dream of giving humanity a new life-building technology. Then he was forced into a nightmare experience which ended his life. He was not even allowed to go in peace. He died in despair that all he had toiled and fought for had now come to nought. It had all been taken away from him by commercial gangsters after they had tricked him with false promises. Schauberger and his son were flown to Texas. All that was required in documents, models, equipment and such material was despatched to U. S.A. The months of June, July, August and September in Texas are the most uncom­fortable. Was it hoped that Viktor Schauberger would quickly succumb under these conditions – temperature at noon between 36° and 41°C? Schauberger and his son were taken to the solitude of the Texan desert near the Red River. There was no communication with the outside world. The post was censored. The answer to the question as to when would the research work begin was ‘Now we have time’. Instruction was given that all findings would be recorded in writing.